17 Apr 2019 / 21:57 H.
KUALA LUMPUR: Bursa Malaysia ended broadly lower today led by selling activities mainly in selected heavyweights, amid a lack of catalysts. 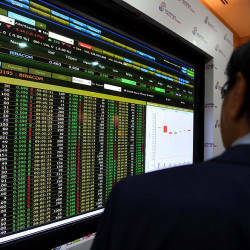 At the close, the benchmark FTSE Bursa Malaysia KLCI (FBM KLCI) fell 8.56 points to 1,620.9 against Tuesday’s close of 1,629.46. 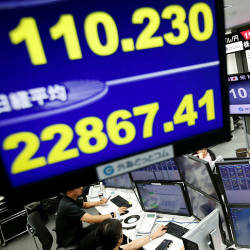 It opened 2.39 points weaker at 1,627.07 and fluctuated between 1,615.53 and 1,627.07 throughout the day. Phillip Capital Management senior vice president (investment) Datuk Dr Nazri Khan Adam Khan expects the FBM KLCI to drag lower towards the 1,600 level in the near term, driven by negative headlines, technical breakdown below the 1,630 support level and further depreciation of the ringgit. “Following the losses on Monday and Tuesday, the local bourse extended its run of losses today as the index value continued to slide close to 0.7%, lowering the index nearer to the 1,600-point support,” he told Bernama. Nazri said the losing streak continued this week after reports earlier in the week of the local bourse being the worst performing major market in the world with more than a 3.0% decline. “It is seen as an isolated case for the local market, as global markets have continued to flourish under fundamental updates on the US Federal Reserve and promising trade deals between the US and China,” he added. The government has also lowered its 2019 economic growth forecast and has been aiming to reduce budget deficits through spending cuts and tax increases. Another bearish factor is global index provider FTSE Russell placing Malaysia on its watch list. 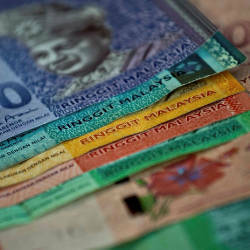 Malaysia is currently assigned a ‘2’ (highest level of accessibility) on the FTSE World Government Bond Index (WGBI), and is being considered for a potential downgrade to ‘1’, which would render Malaysia ineligible for inclusion in the WGBI. “We expect any weakness to be capped by stronger overnight Wall Street. On the global front, US equities turned positive earlier today after improving numbers on quarterly reports of financial sectors leading the gains on Wall Street,” he added. Market breadth on Bursa Malaysia was negative with 661 losers and 208 gainers, while 365 counters were unchanged, 654 were untraded and 19 others were suspended. Volume was higher at 3.10 billion units worth RM1.85 billion against Tuesday’s 2.49 billion units worth RM1.79 billion. Of the actives, Sumatec edged up half-a-sen to 1.5 sen, Daya Materials was flat at one sen, Sapura Energy inched down half-a-sen to 32.5 sen, Bio Osmo and Eduspec slipped one sen each to 6.5 sen and 3.0 sen, and Iskandar Waterfront eased four sen 83 sen. The FBM Emas Index declined 72.89 points to 11,471.58, the FBMT100 slipped 69 points to 11,304.41 and the FBM 70 gave up 125.17 points to 14,306.68. The FBM Emas Syariah Index declined 65.04 points to 11,685.82 and the FBM Ace Index fell 86.62 points to 4,599.09. 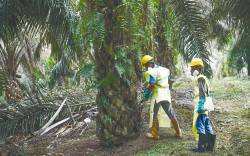 Sector-wise, the Financial Services Index trimmed 112.29 points to 16,687.32, the Plantation Index shed 31.48 points to 7,225.94, while the Industrial Products and Services Index eased 0.73 of-a-point to 167.76. Main Market volume increased to 2.18 billion shares worth RM1.69 billion against 1.53 billion shares worth RM1.62 billion on Tuesday. Warrants turnover fell to 379.85 million units valued at RM78.74 million versus 491.58 million units valued at RM108.37 million yesterday. Volume on the ACE Market increased to 531.76 million shares worth RM80.09 million from 465.64 million shares worth RM65.84 million. Consumer products and services accounted for 420.97 million shares traded on the Main Market, industrial products and services (290.78 million), construction (230.25 million), technology (163.46 million), SPAC (nil), financial services (51.22 million), property (170.19 million), plantation (33.59 million), REITs (9.84 million), closed/fund (5,100), energy (696.19 million), healthcare (35.42 million), telecommunications and media (22.45 million), transportation and logistics (25.59 million), and utilities (34.82 million).